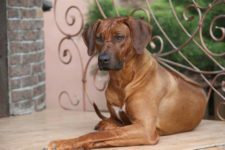 WHAT BREEDS LURK IN THE RIDGEBACK’S GENES? of Red Hot Line kennel! 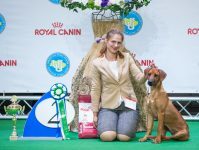 Red Hot Line kennel is a rather big "family" of RR owners living in Ukraine, united by the love to this wonderful breed from South Afrika. At our site we are glad to share the information about our dogs, their successes, about our breeding work and our plans for the future. 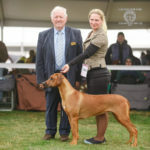 Among our dogs and among the dogs we bred you can find winners and prize - winners of the biggest European Shows, but the main thing - you can find them as real Rhodesian Ridgebacks with nice right temper, good at sport activities (obedience, coursing, etc) and as lovely family dogs. Owner of Red Hot Line kennel name. 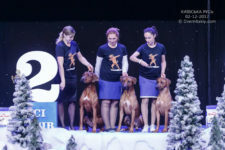 2 х CACIB shows in Kiev. 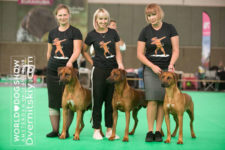 Our Star team has got the titles of brand new junior and adult Ukrainian Champions, our dogs twice have became Best of Breed. And …. RHL — kennel won Reserve Best-in-Show. Happy and proud! 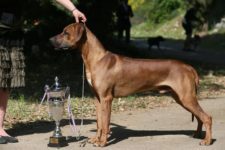 Many congrats to brand New Champion of Hungary in our kennel. 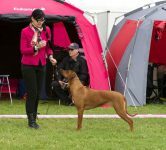 Our Star Team: Red Hot Line Stefani got 3x CAC, R.CACIB, 2 x CACIB, BOS, BOB (44 RR), BIG at Komarom, 2017.10.20-22. Owned and handled by Aleksandra Mozhevelova. 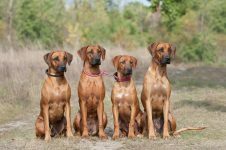 Our young ridgebacks have gained a lot of BOB, BIG and even BISj titles in spring -2017. Among our youngsters — brand new champions of Ukraine, Hungary, Croatia, Belarus, Romania. Many congrats to the owners! Many thanks to handler Aleksandra Mozhevelova. Red Hot Line Stefan — BIS junior in show at Dubrovnik, Croatia. What a wonderful win, what the memories, many congrats to the owners of this beautiful boy. Поздравляем с успешным дебютом на крупной международной выставке в Киеве нашу маленькую принцессу Санничку (Red Hot Line Stefani) и её владелицу Александру Можевелову. Санни — лучший беби породы, резервный лучший беби выставки среди всех представленных пород (RBISb).